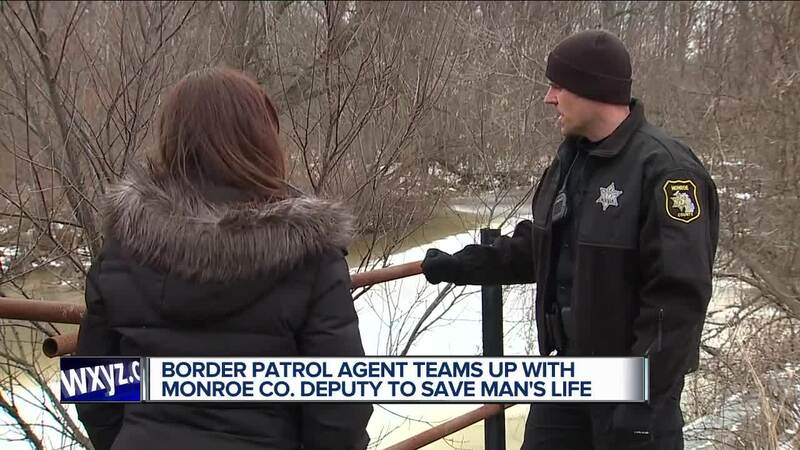 A Border Patrol Agent who is still on duty while not being paid teamed up with a Monroe County Sheriff's Deputy to save the life of a suicidal man. NEWPORT, Mich. (WXYZ) — All too often the call comes in to 911 too late. However earlier this month Monroe County Deputy Brian Sroka got the call with time to try to save a life. He walked with WXYZ down the railroad tracks along Drew Road in Newport to the CN rail bridge where he and a border patrol agent found a man on the edge. “He did have the rope around his neck on one end and the other end was tied around a beam. It looked like he was getting ready to jump off and hang himself,” said Sroka. Deputy Sroka spoke to the man as Agent Brian Maitland moved in behind him. “Agent Maitland from the Border Patrol actually came out here behind the gentleman, walked out on the beam, grabbed a hold of him, secured him, and untied the rope around his neck,” said Sroka. Given the fact this was happening over icy waters Sroka says the fact there was someone else to help may have been the difference between life and death. It turns out while this agent was not being paid because of the government shutdown, what he did is invaluable to one family. “Some people would say, I am not being paid. I am not going to work as hard or what not, but you see somebody like Agent Maitland here and he is just as dedicated as if he is being paid,” said Sroka. It is work they do everyday. Senator Debbie Stabenow (D-Michigan) recognized both men, calling them heroes, while bringing awareness to who the shut down is impacting. Sroka says the man they helped has been on his mind. He wants anyone struggling with depression to know - you can ask for help. “I hope he got the help he needs and whatever he is struggling with he can overcome,” said Sroka.